The MG ZT 260 may appear to be just another subordinate model in the MG ZT range, but this is a car that has undergone very substantial development to arrive at this production level. Hitherto it has been a transverse engine, front wheel drive range, but the 260 was re-engineered to a longitudinally mounted, in line, V8 with rear wheel drive. In this form, the engine displaces 4.6 litres and delivers a lazy but extremely effective 260bhp allied to a stump pulling 410Nm of torque. The engine and gearbox originates from the Ford Mustang GT 2004 model year specification and uses a cast iron block and alloy cylinder heads, each with a single overhead camshaft. There are two large valves per cylinder, which helps maximise low and mid engine rpm power and torque generation. This engine is a direct relative to the all alloy 32 valve twin overhead camshafts per head engine that is used in the MG XPOWER SV models. Prior to the failure of MG Rover a supercharged version of this engine was to be introduced delivering 385bhp and providing a marked increase in performance. Only development cars were ever produced with this engine. The engines power is taken through a very robust (if heavy, a little obstructive and with long travel) 5 speed manual gearbox and delivered to a well proven Dana Hydratrak limited slip differential. Suspension is similar to the FWD cars at the front but at the rear there is a fully independent set up. Steering is also completely new due to the rack having to move forward to clear the engine and this then displaces the brake calipers to the back of the discs but these are still ZT 190 calipers and 325mm diameter vented discs. At the rear there are even bigger 332mm vented discs with AP Racing twin pot alloy calipers. Surprisingly for such a significant change in the cars configuration there is relatively little change to the body. A transmission tunnel is created which takes some space from the footwells and half of the spare wheel well is used for the new rear suspension and drive. The latter dictates that no car comes with a spare wheel, only a couple of cans of tyre repair and re-inflating spray. The wheels on the car are alloys in the same size as other ZT models but because of being under greater load in this model only the ‘Straights’ and the ‘Apex’ designs were used. Tyres are the same 225/45x18 Continental Sport Contact M3 that were current on other ZT models using the 18” wheel size. The reference to M3 does relate to the BMW M3 as this is the tyre developed for that model. The launch of this model was delayed from 2002 into September 2003 and this led to the odd situation of the model being facelifted along with the remainder of the ZT range in February 2004. The external look of the cars always mirrored that of the FWD ZT saloon or tourer with only the tell tale quad exhaust tail pipes and badges differentiating the model from mainstream ones. Whilst visually close the sound and way the car drove was nothing like the mainstream models! Mention also has to be made of the Rover 75 V8 that was introduced at the time of the facelift. Available in saloon and tourer format it offered a softer mix than the MG although the basic layout and components used were the same. The biggest mechanical difference being the use of a four speed auto gearbox, again from the Mustang, and it had very little effect on the performance of the car. It would have become an option on the MG range in time, but by the time MG Rover collapsed only a few export MGs had been fitted with this auto. The engine characteristics lent itself very well to auto transmission. 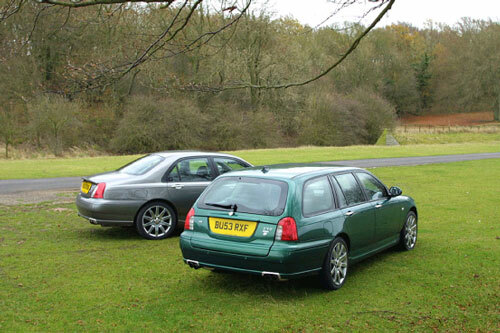 It is not known exactly how many Rover 75 V8 models were made although an accurate estimate will be between 75 and 100. As both the Rover and MG V8 models were developed under the same X12 and X13 project codes (saloon and tourer) they are all identified under the same VIN codes, so that number is within the total of 883 V8 cars made. The same lack of detail is known about the split of saloons to tourers, although the ratio in both MG and Rover ranges is estimated at approximately 10 to 1. One interesting fact known is that the change to the 2004 model year facelift was done at VIN 216 and since the VIN sequences started at 001 that provides the clarity on the number of pre facelift cars. Interestingly VIN 001 is allocated to the very special MG XPower ZT 500 concept ZT model that started the V8 model range towards production reality. Specially built with a 500bhp supercharged 32 valve version of the engine, 6 speed gearbox and many other one off features including an aggressive but integrated bodykit, the car was saved by the MG Owners Club and rebuilt using the Clubs very extensive facilities and expertise. The beautifully restored car is often displayed at shows and at the Clubs HQ.